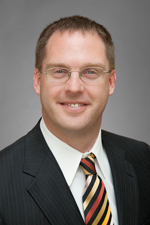 T.J. Leake concentrates his practice in the areas of business transactions and estate and financial planning. Mr. Leake has been involved in advising corporations, associations and not-for-profit corporate entities on various corporate formation matters, mergers, acquisitions and governmental issues. He also advises clients regarding estate planning and administration matters. In addition, Mr. Leake focuses his practice on advising closely held and family businesses on ownership relations and succession planning issues. He is active in the pro bono program at Hinshaw & Culbertson LLP, assisting various charitable organizations in all aspects of corporate matters. Mr. Leake joined Hinshaw in August 2002. During law school, Mr. Leake served externships with both the Securities and Exchange Commission and the Honorable George Lindberg of the U.S. District Court, Northern District of Illinois. In addition to his other law school accomplishments, Mr. Leake was a member of the John Marshall Law Review, Phi Delta Phi and Staff Editor of the Review of Intellectual Property Law.